Reinhilde Veugelers investigates the patterns of worldwide research and development spending in a Policy Contribution for the European think-tank Bruegel: "The World Innovation Landscape: Asia Rising?" The results are a useful reminder that thinking of China and the rest of the emerging economies as depending on low wages to drive their economic growth is so very 20th century. In this century, China in particular is staking its future economic growth on R&D spending and innovation. As a starting point, consider snapshots of global R&D spending in 1999 and in 2009. 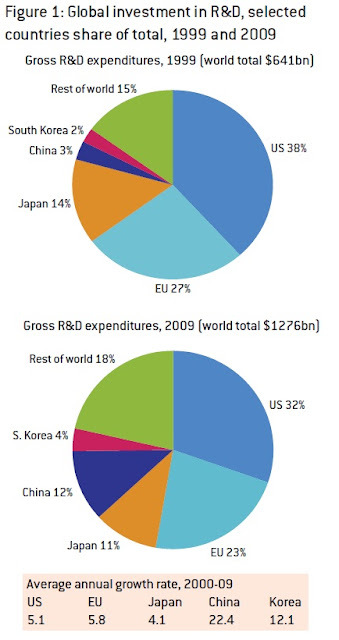 The share of global R&D spending done by the United States, the European Union, and Japan is falling, while the share done by China, South Korea, and other emerging economies is rising. 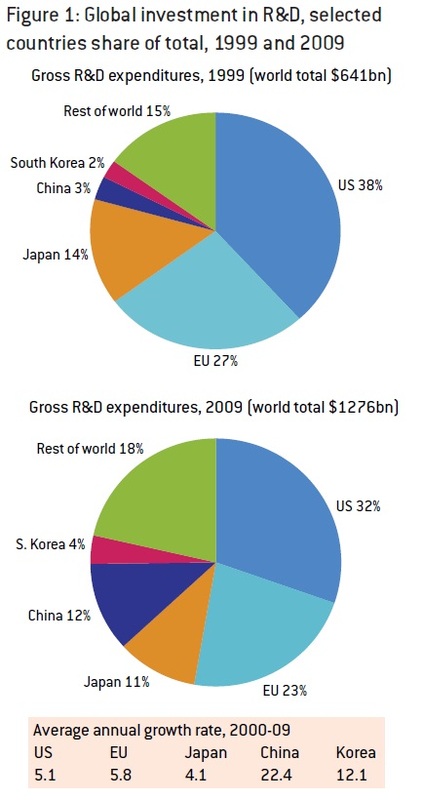 Looking at individual countries, China has now outstripped Japan for second place in global R&D spending, and China's R&D spending is similar to that of Germany, France, and Italy combined. 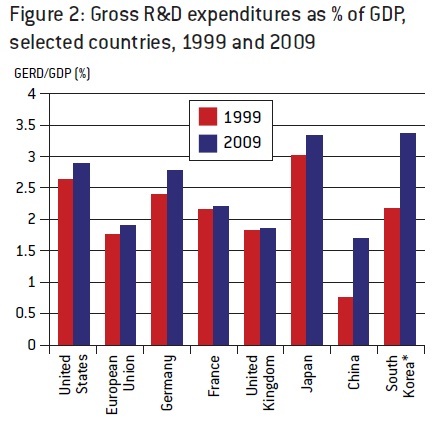 Veugelers looks more closely at the group of seven countries that together account for about 71% of global R&D spending. Here is how much they spend on R&D as a percentage of their economies: by this measure, the U.S. economy does not especially stand out. Veugelers also takes a more detailed look at government and private R&D spending in these seven countries, and finds some intriguing differences in priorities. For example, more than half of all U.S. government R&D spending goes to defense, a far higher share than any of these other countries. The U.S. government also commits a larger share of its R&D budget to health. South Korea and Germany stand out for having a greater share of their government R&D focuses on industrial production and technology. And a number of countries devote a larger share of their government R&D to the "Other" category, which includes "earth and space, transport, telecommunications, agriculture, education, culture, political systems." In the private sector, a greater share of the U.S. private-sector R&D happens in the services sector, while the private sector in other countries focuses more of its R&D spending on machinery and equipment. It's worth remembering that there's a lot more to innovation than just research and development spending. Yes, a nation that is the home of new innovation probably receives a disproportionate share of the gains in productivity as a result. But innovative discoveries can flow across national borders.The true economic gains from innovation are not from a discovery in a laboratory, but rather from the economic flexibility that translates the discovery into new products and jobs.